As blood flows through vessels, it moves fluid through every tissue in the body. 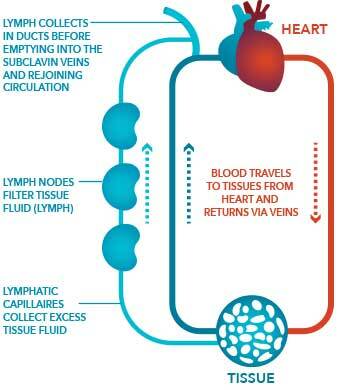 From the tissues, fluid is carried into lymph vessels that eventually return it to the blood. 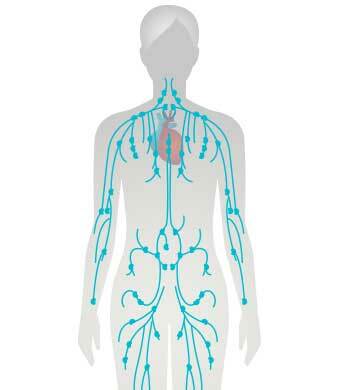 This flow allows the immune system to gather information about the state of the body, noting signs of disease that are carried into the lymph system. Lymph nodes, strategically positioned along lymph vessels throughout the body, function as the brain center of the immune response. Lymph nodes, strategically positioned along lymph vessels throughout the body, function as the brain center of the immune response, serving both as sentinel sites to detect signs of disease and command centers to train and mobilize immune cells to combat disease. Lymph nodes contain millions of immune cells, each with specific roles to play in cooperatively detecting and responding to disease. Specialized antigen-presenting cells (APCs) residing in the lymph nodes constantly sample materials flowing through the lymph to look for molecular cues of danger from disease throughout the body. These molecular patterns, commonly in the form of proteins and peptides (antigens), DNA, and small molecules, are internalized by APCs, processed for information, and presented in specific signals to effector immune cells. Conventional immunogens are never detected by immune cells in the lymph nodes, and fail to optimally stimulate immune responses to effectively eliminate disease. Lymph flow is a one-way street for some molecules, but not all. 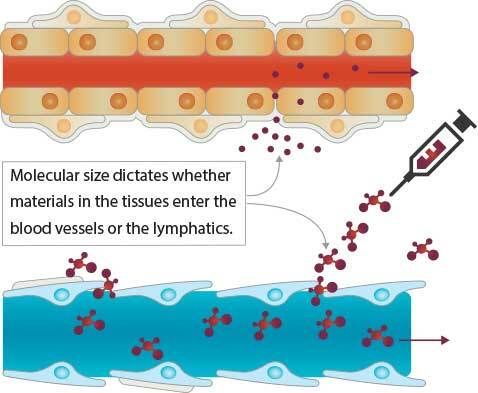 Larger molecules such as proteins are unable to fit through the pores lining small blood vessels in the tissues and are carried by the lymph flow into the lymph nodes. However, other molecules commonly used as vaccines or immunotherapies – including the majority of peptides, DNA, and small molecules – easily pass through the vessel walls and are quickly flushed away into the systemic circulation without ever entering the lymph node. These conventional immunogens are never detected by immune cells in the lymph nodes, and fail to optimally stimulate immune responses to effectively eliminate disease. Instead, these immunogens are delivered by the blood stream to irrelevant sites, are cleared from the body, or stimulate widespread toxicities.